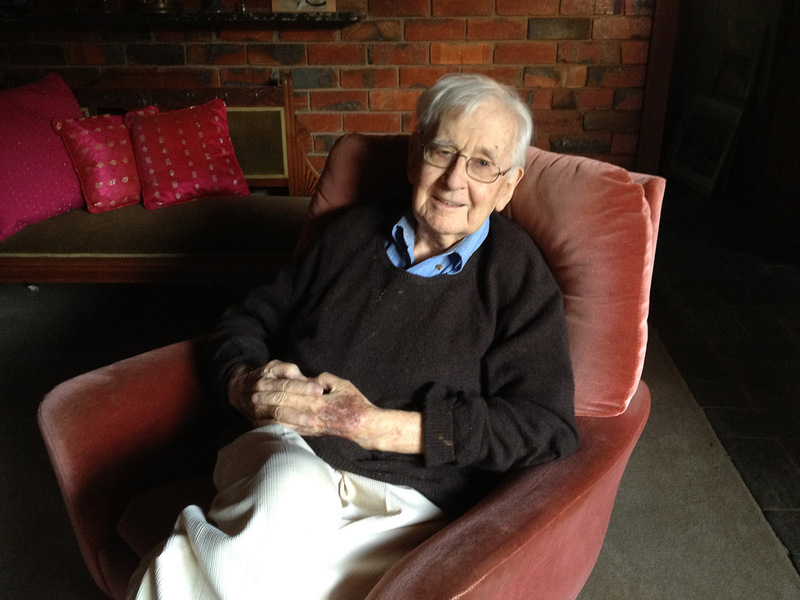 I was saddened to hear of the recent passing of James Sullivan, a former officer at Tatura internment camp, on March 22, 2012. Jim was 91 years old. I was glad to have had the opportunity to get to know him. He was an entertaining raconteur, keen to share his knowledge, and author of Beyond All Hate: a wartime story of a Japanese internment camp 1941-1946, his self-published account of his time overseeing Japanese internees in Victoria. 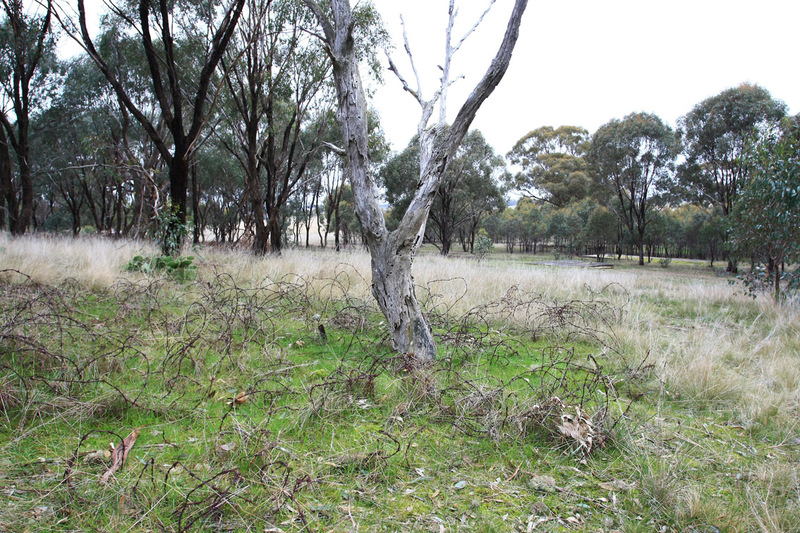 In July last year, retired army major James Sullivan was kind enough to give me a tour of the site of the Tatura family internment camp near Shepparton in northern Victoria. At 91 years old, Jim still has the ability to tell a good tale and draw upon his memories of 70 years ago. Jim was one of the officers employed to supervise the camp, which held many Japanese families. At age 22, he was one of the youngest officers assigned to the camp (after being injured while serving in New Guinea he was posted to supervise the camp), and as a result he became friendly with many of the Japanese families interned, and in 2007 he self-published a book about his experiences, Beyond All Hate: The story of a wartime internment camp for Japanese in Australia, 1941-1946 (available from Tatura Museum: www.taturamuseum.org.au/museum_shop.html). 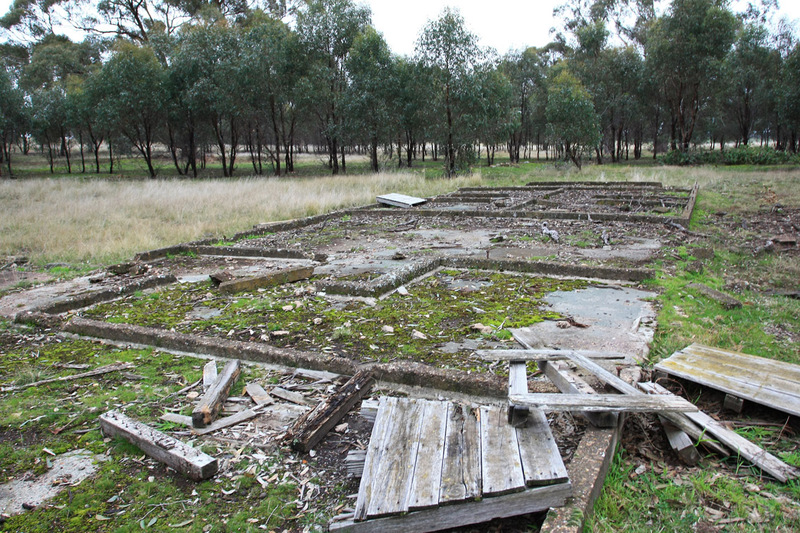 Remains of the shower block at Tatura internment camp. A quick history: the Tatura internment camps comprised seven separate camps in total. Three of the camps were for POWs, while the remaining four were for internees. Of the internee camps, two were for single males (mostly German and Italian), one was for German families, and another, Camp 4 near Rushworth, was for Japanese families. Each of the camps housed about 1000 internees (http://www.taturamuseum.org.au/prisoner_of_war__internment_camps.html). Japanese internees at Tatura line up for a dental check (Australian War Memorial, 052460). The family camps were established to house women, children and family groups of “enemy aliens”. In some cases, the Australian wives and children of internees chose to live with their husband/father in the family internment camp rather than be separated from him. Teenage boys under the age of 16 lived at the family camps, but after 16 they were transferred to the camps for single adult men. 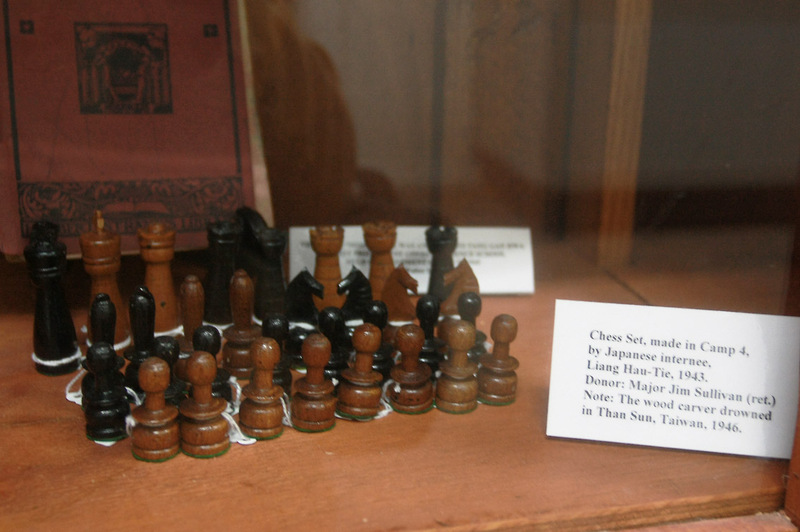 Wooden chess set at Tatura Museum made by a “Japanese” internee (from Formosa/Taiwan), donated by James Sullivan. After a quick stop at Tatura Museum (a very good regional museum, with informative displays about the internment camps, irrigation projects and other aspects of local history, see: www.taturamuseum.org.au), we made our way to the site of the camp. Like most of the other sites of internment camps around Australia, it now sits on private land. Luckily for me, the person who rents the land, a dairy farmer, was also keen to hear more of the history of the camp, and as such was happy to meet us. 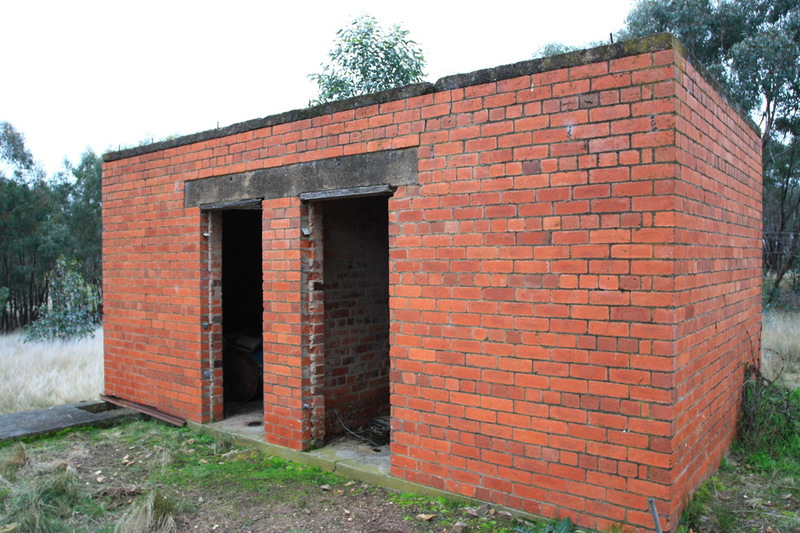 The “prison” at Tatura internment camp – for misbehaving individuals. Unsurprisingly, it was the most robust building and is the only building still intact today. 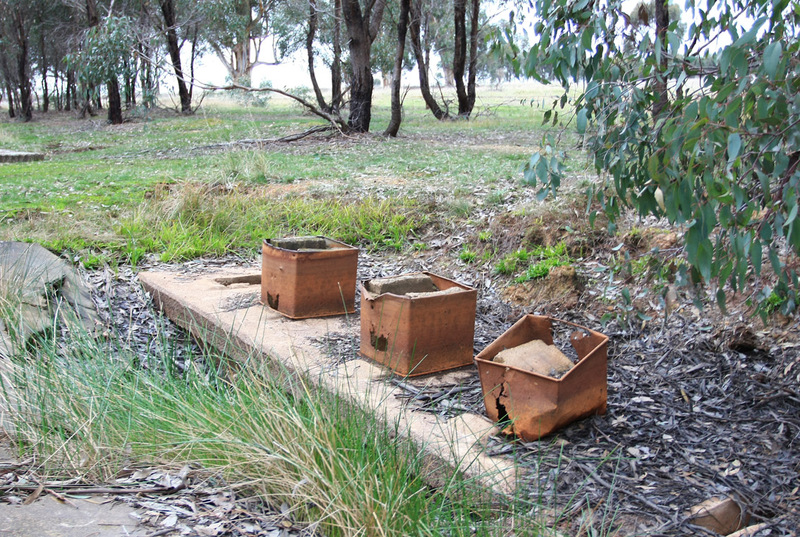 Like the other internment camp sites I have visited around Australia, there is little that remains of Tatura: the concrete foundations of the lavatories and the shower blocks, and coils of discarded barbed wire that were left in the field to rust after the camps were dismantled in 1946. Lavatory “cans” that internees sat on to do their business. 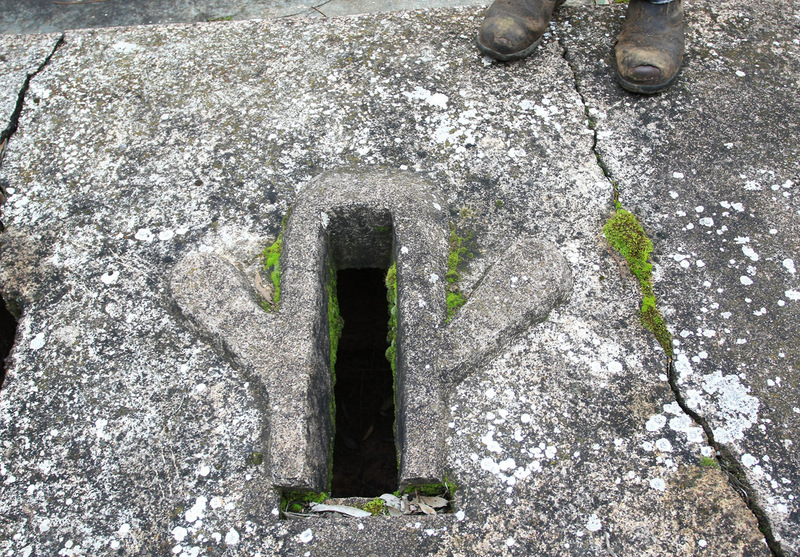 Japanese internees made these Japanese-style squat toilets, complete with foot pads! Barbed wire that was discarded after the camps were dismantled. 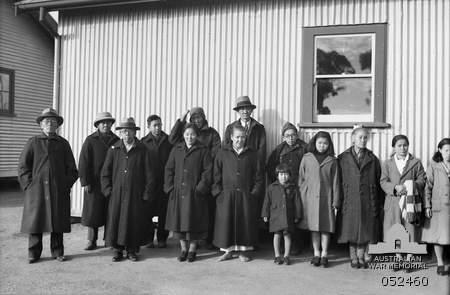 In 1993, James Sullivan organised a reunion of former Japanese internees at Tatura internment camp in Victoria. Forty-six people came from Australia, Japan, Taiwan and other countries to attend the reunion, and were greeted with hugs and tears from their former fellow internees. Having spent up to six years in internment in Australia during the formative childhood and teenage years, the camp irrevocably shaped their lives. Seeing their old friends and acquaintances brought back memories both happy and sad. They erected a plaque to honour the reunion and the memory of their time in internment—it is possibly one of the only plaques dedicated to the experience of civilian internees in Australia today. 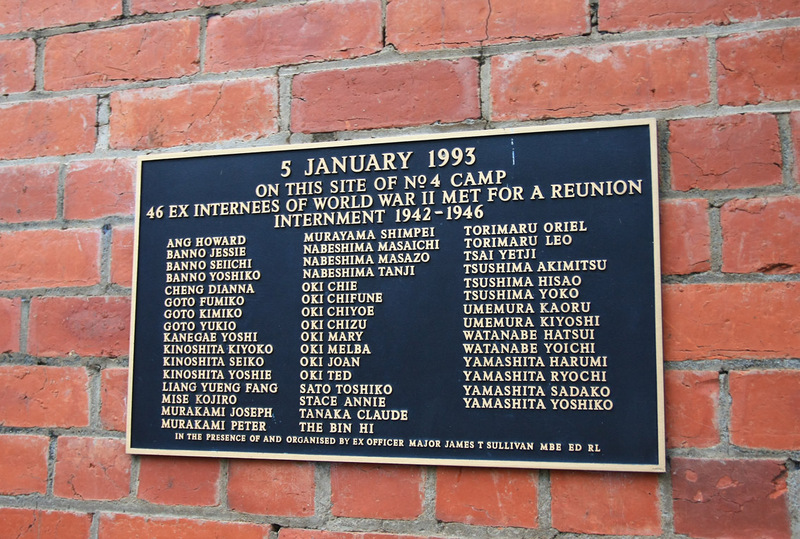 Names of the 46 ex-Tatura internees who returned for the reunion in 1993. My mother Marie WYMARK (Brisbane) lost touch with her childhood friend Mignonette KASHIWAGI, who was interned at Tatura during WW2. She was not allowed to contact her friend and talked about this sadly until she died in 2004. Hi Jan, thanks for commenting. I just had a quick look on the electronic files on Mignonette Kashiwagi available on naa.gov.au – she was an Australian-born 20-year-old physiotherapy student at the University of Queensland in 1942 when she was interned. She was released from Tatura in December 1943. I wonder what became of her? At least she only spent 20 months in internment. Many others were interned for six years! On November 21, 1946, reported to the federal authorities, that there is no problem behavior to the person, officer that was carried out continues to monitor to Kashiwagi, line is canceled limit order on December 20, is cracked. Solved a limit order on August 17, 1945, as Australia subjects, Mignonette Kashiwagi is a daughter of Kashiwagi, got a job as a physical therapist to a hospital in Perth. In June 1948, conduct a passport application for the purpose of academic, to travel to the UK, she is allowed. Her father apparently died in Sydney July 2, 1954. I wonder how much they saw of each other after the war? Would love to here more of your mother’s memories about Mgnonette. Hi, I’m writing up the story of Con Gigliotti, whose father Luigi Gigliotti was interned at Tatura in June 1940 for five months as an enemy alien, before being transferred to Hay, Orange, Loveday and Wayville, until he was released in May 1943. He didn’t ever return to live with his family in Tallangatta after his release. He has been recognised, however, for his work in establishing the Murchison Italian War Memorial and Chapel. Have you come across Luigi in your research? After commencing my read of After Darkness I was intrigued to investigate about a friend of mine many years ago, Jim Sullivan, who at one stage told me about his experiences as a guard at an internment camp and New Guinea. We had a commonality as I had lived in New Guinea. I hope the Jim Sullivan above is the same man. Jim was about 20 years older then me. At that time he worked for CML as an insurance agent and our first meeting regardin insurance I think I opened the conversation that I didn’t trust any salesperson, particularly insurance ones. Jim was very kind to me, a young mother who had to walk out of a violent marriage. As ones life changes I lost track of this Jim Sullivan, sad to hear of his passing. I am sure it is the same one, wife Rosa and the inside of the house the one at Camberwell, from the photo. Jim did seem to be a bit of a loner, my mother and I saw him once in New Zealand of all places. Thanks for stirring some memories of a previous lifetime of mine.